Tundra's Great Idea Series are early-reader biographies. The third book in the series introduces the fascinating Margaret Knight. Known as Mattie, she was different from most American girls living in 1850. She loved to make things with wood and made the best kites and sleds in town. Her father died when she was only three and by the time she was twelve she was working at the local cotton mill, alongside her two older brothers. One day she saw a worker get injured by a shuttle which had come loose from the giant loom, and the accident inspired her to invent a stop-motion device. It was to be the first of her many inventions. 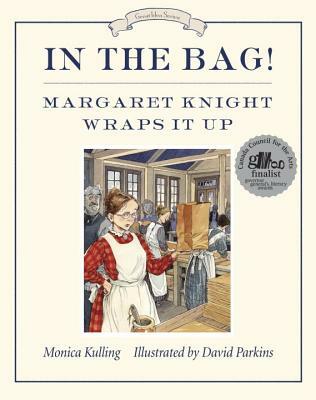 Margaret devoted her life to inventing, and is best known for the clever, practical, paper bag. When she died in 1914 she had ninety inventions to her name and over twenty patents, astounding accomplishments for a woman of her day. Monica Kulling deftly uses easy-to-read language and lots of dialogue to bring an amazing, inspiring woman to life. Monica Kulling was born in Vancouver, British Columbia. A poet, she has also published many books for children. Best known for her clear and engaging biographies, she has tackled subjects ranging from Harriet Tubman and Eleanor Roosevelt to Harry Houdini. Her book It's A Snap! George Eastman's First Photograph, illustrated by Bill Slavin, was the first in Tundra's Great Idea Series. Monica Kulling lives in Toronto. The author lives in Toronto, Ontario. Award-winning artist David Parkins has illustrated more than fifty books for children. He began his career at Dyfed College of Art in Wales, where he studied wildlife illustration. From there, he attended the Lincoln College of Art. Upon graduation, he became a freelance illustrator who spent many years drawing for the British children's comic The Beano and producing illustrations for several educational publishers. David Parkins is the illustrator of the critically acclaimed Clip-Clop by Eleanor Koldofsky. Praise for In the Bag!